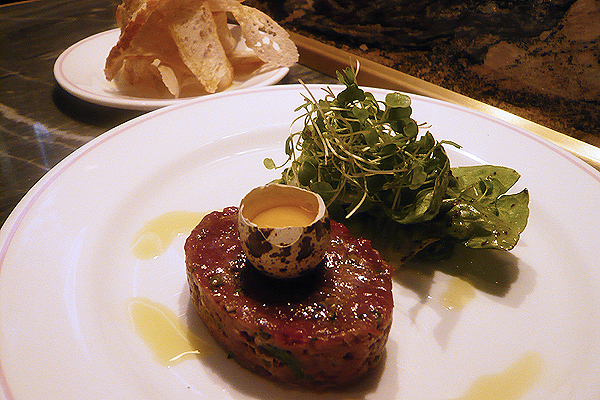 Considering that Bob Bob Ricard opened back at the end of 2008, when I was still working on nearby Great Marborough Street, it really is a wonder that I had not set foot in the eclectic all-day eatery sooner than three Sundays ago. 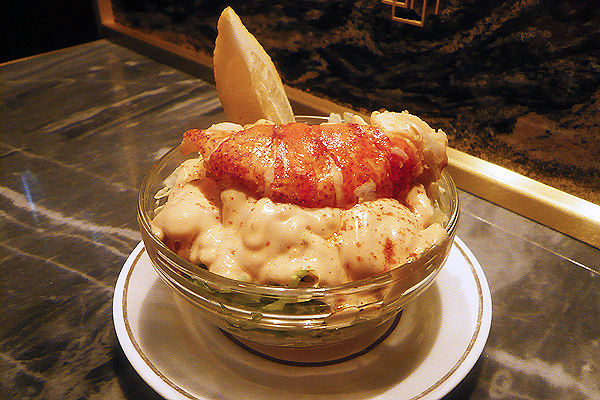 The minute I stepped through the opulent gilded doors I fell in love – everything from the plush art-deco styling, to the quirky retro-inspired menu and inventive cocktail list, were right up my street. The place felt like serious favourite haunt material, and this was before I had even had a bite to eat. We had arrived early as we were trotting off to see Melody Gardot (who was amazing) at the Palladium after, and as the waitress escorted us past a row of adorable one-seater tables, we noticed that there were already a few tables tucking into their dinners. We slid into our booths, marvelled at the “Press for Champagne” button (well I did, B was less interested), then got down to business, scanning the drink and food menus. We both went for the signature Rhubarb G&T which I found deliciously light and refreshing. B however wasn’t quite as enamoured, finding it excessively sweet (and possibly a little too pretty). The pink nectar slid down easily (my only gripe – the glass needs to be a whole lot bigger, perhaps the size of a jug) so we soon had to order more drink, this time wine from their competitively-priced list which cheekily highlights price differentials to other establishments, many of them significant (for example a 1999 Meursault “Les Charmes” from Lafon listed at £175, is priced at a remarkable £503 at The Greenhouse). As we were making our beverages choices, the starters arrived. Mine was a Lobster Cocktail, originally down on the menu as Langoustine Cocktail, but they had run out so made the upgrade for me at the same price. The lobster was sweet, meaty and perfectly cooked but unfortunately let down by the over-dressed lettuce drowning in cocktail sauce. B’s first course of Venison Steak Tartare was a lot more balanced, the deep savoury meat laced with a touch of sweetness and a whisper of peppery heat. The thin curly croutons were an excellent neutral vehicle for the tartare, matching the soft moist venison with a delightful crunch. Where the shellfish cocktail fell short, my Veal Holstein made up for in bucket-loads. I had spied the veal on the tiny specials card, and upon reading the description could not resist ordering it. 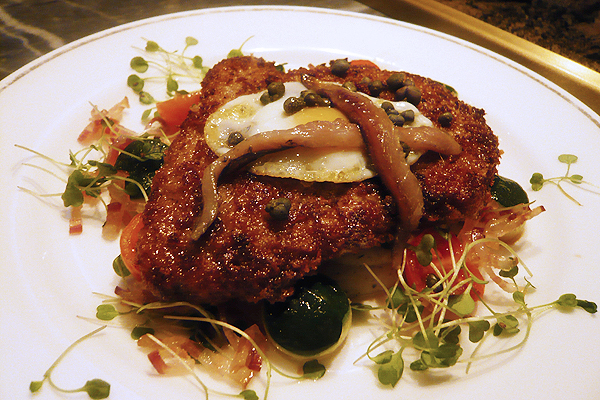 Breaded Veal Sirloin with a Fried Quail’s Egg and Anchovies, served with Cherry Tomatoes, Courgette Pebbles, Truffled Mashed Potatoes and a Secret Sauce. Sounds phenomenal, right? Let me tell you, the dish tasted every bit as good. Juicy veal in a breadcrumb coating crisped in butter, paired with umami-rich anchovies and truffled mash – each mouthful so tasty that I was eager for the next bite. 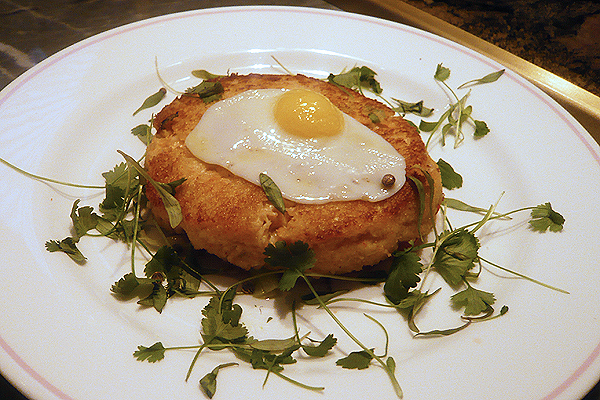 B equally enjoyed his main of Cornish Crab Cake with Tomatoes, Leeks and a Fried Quails Egg. The delicate hand-crafted mound fell apart easily when cut into which in my opinion is the sign of a good crab cake – it means there isn’t any unnecessary potato filler binding it together. From a presentation standpoint, I did find that the wilting herb garnish looked a bit sad on the plate. But flavour-wise, no complaints. Sadly after a quick coffee we had to dash off sans-dessert but it was an utterly enjoyable meal nevertheless. Admittedly it isn’t cheap and it does add up, but the menu is diverse enough that there are plenty of more reasonable options available. I’m already booked in for a dinner with the girls next week, and am making mental plans to head there for a lazy weekend brunch, an indulgent afternoon tea and maybe a solo visit, to get peacefully stuck into a burger, side of fries, and a clear bloody Mary. My first instincts were right, this is definitely my new favourite place. ~ by gourmettraveller on May 6, 2010. Thanks for the recs Kavey! as much as I’m tempted to go for the veal again on my next visit, I probably should try something new! I love the opulent art deco style – it feels so glamorous. I haven’t been since it first opened, so I need to get back down there. 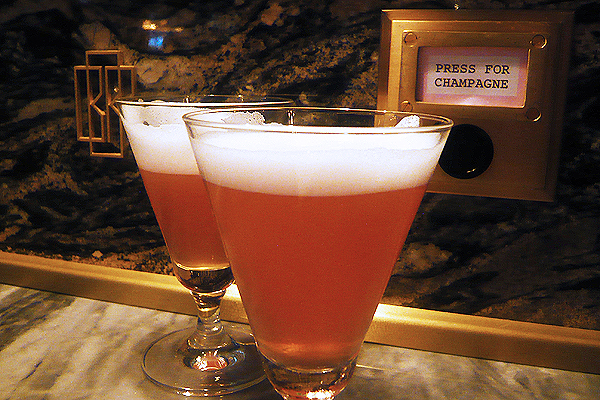 Anywhere that has a button for champagne has my vote! Well, join the club! Mrs. LF and I first went here a while back and instantly fell in love with its quirkiness too. I don’t know what it is, but I just feel at home there, and perfectly looked after no matter who is waiting on us and at what time of the day or night. I am also quite impressed with the training regime, as you can ask any of the waiters anything about the menu and they will answer you in detail without consulting the kitchen. The wine list is fantastic and great value (they have d’Yquem at cheaper prices than you can often get at retail shops, i.e.) and the underground bar is spectacular. Having had afternoon tea, brunch, lunch and dinner, I don’t have any complaints on the food, and the cocktails are very good. Never tried their burger, though heard good things, so maybe we should go for this on our impending visit :). Surely, i will read your next delicio postings.Keep up the good work!